Our Parish Cell of the Society was inaugurated on Wednesday 23 February 2005. Fr Philip North, the Priest Administrator of the Anglican Shrine, preached at the Inaugural Mass and presented the certificate recording the event. It now hangs on the south wall of the sanctuary in the Lady Chapel. Fr Nicholas is Ward Superior. The Cell continues to grow, with approximately twenty-five members, and a number of parishioners are currently exploring the possibility of joining the Society. In January 2012, a hand-carved image of Our Lady of Walsingham was dedicated and now provides a focus for all Cell gatherings. The image is painted in mediaeval colours, and was made possible thanks to the generosity of Fr Paul Armstead, our then departing Assistant Curate, as well as Cell members. Following a Sunday morning presentation by Cell members about the Shrine, including personal testimony of what it had meant to various individuals, a Day Pilgrimage took place on Saturday 28 April. This allowed first-time pilgrims to visit the Shrine and experience first-hand why so many continue to be drawn to this remarkable place in rural north Norfolk. Our annual residential Parish Pilgrimage took place from Monday 21 – Friday 25 May, and was a great success. A gallery of images from our time together may be viewed below. The Society exists to encourage and support devotion to Our Lady of Walsingham and Pilgrimage to the Shrine. 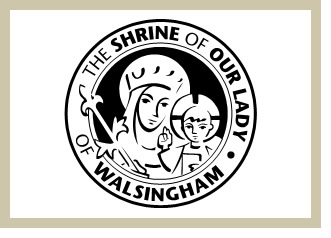 Members receive information and news from the Shrine three times during the year, including the Walsingham Review in December and August. In addition Priests Associate are asked to offer Mass, monthly if possible, for the work of the Shrine and for all who visit the Holy House and are interceded for there. A lamp burns for members of the Society and Priests Associate in the Holy House; they are prayed for each day at Shrine Prayers at Walsingham and by members of the Living Rosary. Departed members are remembered at Shrine Prayers, at a Requiem Mass and their names are recorded in the Walsingham Review. Mass concludes with the singing of the Angelus or, in Eastertide, the Regina Coeli. The Cell Mass is followed by refreshments and a meeting of members in our Parish Centre. At these gatherings Cell business is advanced, and there is a discussion of the issues raised by the homily. The Parish Cell maintains a lamp in the Holy House, the most sacred part of the Shrine, and actively supports the on-going renewal and development of the Shrine and its facilities through subscription and fundraising activities. and to encourage Christians to seek our Lady's help by pilgrimage to that holy place. and ever remind you of the love of God in sending his only Son to be born of a pure Virgin, to raise our lowly nature to the heights of Godhead. and be found worthy to live with you for ever in glory. may you bear it without fault to life everlasting. † in the name of the Father, and of the Son and of the Holy Spirit. When all have been admitted a seasonal anthem to Our Lady may be said or sung. repentance of sinners, peace to the departed. our Lady of Walsingham, intercede for us. Amen. Fr Nicholas and I had adjacent rooms at St Stephen's House. He can testify that I'm a quiet, compliant, calm, obedient sort of person who never once kept him awake with rowdy parties! Sadly, not always thus. About one year ago, I went back to my old Secondary School to preach at Founders Day. Teachers who remembered me found it highly amusing that I was a priest and began to remind me of all the scrapes and scandalous episodes of my youth. The biology teacher had an especially good memory. Everyone in class had to bring in a flower to identify the constituent parts. Boys of course conveniently forgot. Girls brought beautiful bunches of daffodils. For a bet, my friend Brian Harries and I went round the whole class eating all the daffodils, so beautiful bunches of flowers became less than beautiful clumps of stems. Not only were we banned from the biology laboratory for the rest of year, we were both horribly and violently sick! Results of all this - I have little knowledge on the subject of cells, I'm sure they covered them in biology. I just wasn't there. And it's a bad thing to miss because they're what I'm made of. I do, however, know one thing about cells. They grow. In fact, that's about all they do. Don't choose to grow. They just do. It's their natural state. St Matthew - a cell of the Society of Our Lady of Walsingham. First thing I want to do on behalf of the Shrine is to say thank you. Thanks to Fr Nicholas, to Jean (Collins), to the members and to all who have been involved in this new enterprise. It's an exciting day not just for you but for all who love Walsingham. Big new cells such as this are a really encouraging sign of the health of pilgrimage to Walsingham as we prepare to celebrate our 75th anniversary in 2006. But what's it all about? What is your cell for? Well, like all cells - it's there to grow. In particular, I hope it will grow in three ways, each one of which reflects something of the ministry of the Shrine as a whole. First of all: I hope that in your cell you will grow together in love. I hope that you'll enjoy being a cell, that you'll look forward to each meeting, that you'll take delight in each other's company. I hope you'll become a real community, joined together by your love for Mary and her Son. Because that oneness amongst you - it's not just about having good times. It will reflect to your parish and to this community something of the Shrine's ministry of reconciliation. I spent some of last week in Bosnia. It was a fascinating but very disturbing visit. I have never seen poverty like it, and a sense of menace hangs over the country, not because war is going to start again, but because forgiveness has not yet begun. We were there under the auspices of a church called Soul of Europe who try to get people who have been in conflict to talk to each other. They want to arrange a conversation between Croat and Serb-Catholic Orthodox. And they rang up out of the blue to say that the only place in world where that conversation could take place was in Walsingham. Walsingham - a place where, through Mary's prayers, people are brought closer to God. And as they do so, they are brought closer to each other, and forgiveness and reconciliation can begin. So, as a cell, grow together in love. Enjoy the fellowship you have with each other. And remember - it goes far deeper than you can begin to imagine. The second way in which cells should grow is in faith. We've just heard in the Gospel a most astonishing story. A young woman gives her life to God in an act of reckless, dangerous discipleship. How could Mary take such risks? Because her life was patterned on God. And so it continued. How often do we read of Mary pondering things of God in her heart? She listened and she went on listening. That's how she could discern where God was leading her. That's how she could remain faithful, even at the foot of the cross and in the upper room. A cell is there that its members might come together to pray. Each time you come together you will go in heart to Walsingham to pray in the Holy House. And as you do so, you will draw ever closer to God, and discern his will in your life. It gets on my nerves when people call Walsingham a pilgrim centre. That's not what it is at all. It's a place of prayer and because it's a place of prayer people go there on pilgrimage. The praying is everything. Through your cell, you will become part of that daily round of prayer. And as you do so, your life will become more and more patterned on God's life, and you will grow in him. And the third way I hope your cell will grow is, quite simply, in strength. In numbers. Occasionally - though fortunately not all that often, I come across a cell that has lost its way. It's become a holy huddle, a group of people for whom Walsingham is 'their thing!' But what is at the very heart of the Shrine? A Holy House where a young girl gave her life to God. Walsingham - a place of conversion. It's a place where, through experience of pilgrimage and through Mary's prayers, others might be drawn more deeply into the mysteries of faith. How dare we keep that to ourselves? So part of the role of a cell - to promote. You with others - have received joys and benefits of pilgrimage. So encourage others to discover that too. I hope that a cell can be an ambassador for the Shrine within its parish. There's something for everyone at Walsingham. For younger pilgrims there's children's pilgrimages or youth pilgrimages in the Summer. There's a special weekend for families in November when children come free of charge. There's a young adults pilgrimage at the end of this season. Those are really lovely opportunities for people of all ages to find something special on Walsingham's holy ground. So I hope we can work together to tell the good news. Growing together in God. Growing in faith. Growing in strength. That you might grow in the school of Mary - may that be our prayer for your cell as it is formally launched tonight.